When I first started writing this it was going to be a general post about “Where I Shop & Why”, but once I started writing and compiling all my tips I soon realized it was way too long for one post because I wanted to include everything from men and women’s fashion to kids, as well as my top stores for shopping for the home. So instead I will break it out into four separate posts and I will start with where to shop for women’s apparel and why. 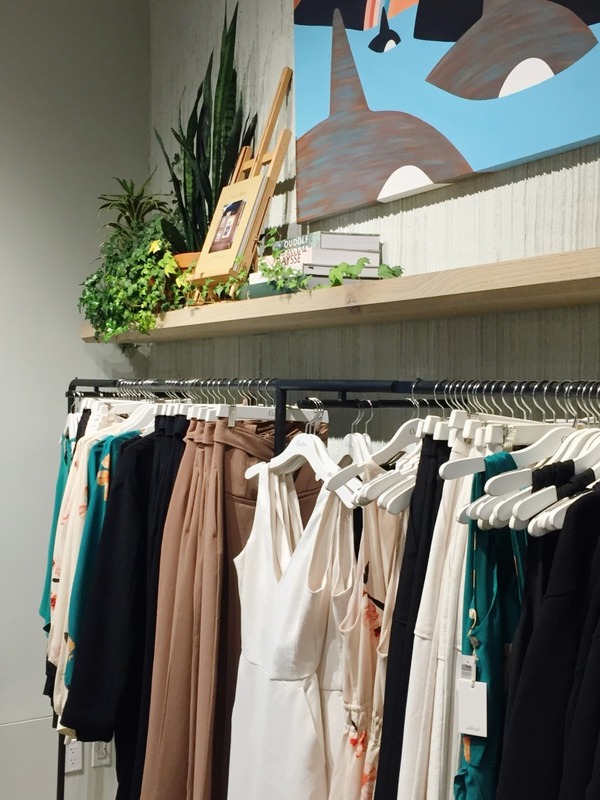 Here are some of favourite women’s stores that complete my shopping fix along with the scoop on what to shop for, annual sales, reward programs, and more. If you’re in Calgary you’ll want to pop into Adorn Boutique in Inglewood to indulge in everything pretty. 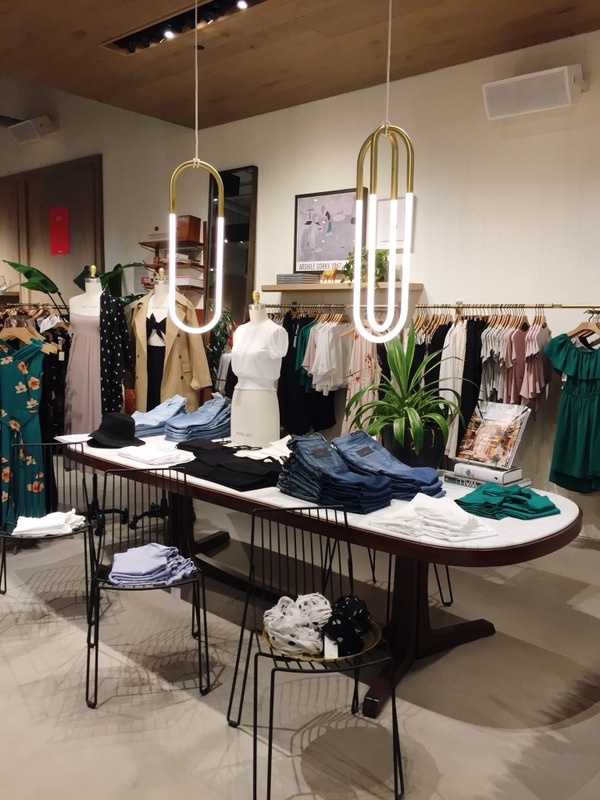 They carry some of my favourite brands like Free People, Gentle Fawn, InWear, Kaffe Clothing, and For Love & Lemons; they also have a few jewelry cases full of delicate and feminine pieces. It’s a great spot to find unique lingerie, casual clothes, jeans, sweaters, dresses, flowy tops, and jackets. Some of the clothes they stock are in beautiful floral prints but you can also find lots of items in pretty pastels and neutrals too. Check out their Instagram account to get a feel for the style. Adorn is a small boutique but you feel right at home like you’re shopping in your girlfriend’s closet because the staff are so sweet and helpful. Every now and then they do special shopping events where you can go and shop new arrivals or the best sale items before they’re gone! They also always have at least one dedicated rack to sale items too. I love browsing Anthropologie because there is so much to take in when you walk through those doors. Everything from the artistic window displays to the well-style mannequins, eclectic home décor and vintage-inspired jewelry. The look and style is quite specific so you pretty much know when you walk in if it’s your vibe or not. So, what’s so great about them? Well I love a store that incorporates items for the home and clothing all in one place. They offer 14 day price adjustments so always save your receipt because it might be worth checking back to see if your item went on sale or has been further discounted. And let’s talk about Anthro’s sale section for a second. It’s that special room in the back of every store that I’m known for bee lining to right away when I walk in. There are always hidden gems in there because people will return online items in-store and instead of going back to the warehouse they usually end up in the sale section. Also, the sale section usually has an additional 30% off promo making those price tags more and more affordable. And for all you teachers I believe you receive a special discount (depending on the province) when you shop and show your teacher card. I’ve been shopping here since grade seven and it’s safe to say I STILL love this store. FYI, I’m in my 30’s now but I swear this store never gets old. What can I say, Aritzia keeps me young. 😉 But seriously they’re awesome for staple pieces or if you’re thinking about going the capsule wardrobe route. I usually get about three items from there every year because they have great quality pieces that really carry me through. That being said, be sure you’re happy with your selections because they aren’t great with returns. You only have a quick 10 days for a full refund and I’ve always struggled with that policy. I prefer stores that have more flexibility and are easy to deal with. And, all sale items are final sale – ugh the worst. When it comes to sales, I’ll be honest, Aritzia doesn’t have big markdowns. We’re talking just the usual $5 off. 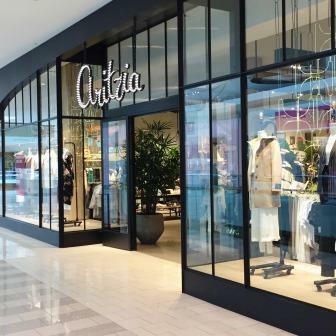 But, did you know Aritzia has a HUGE warehouse sale in Vancouver every year? It’s usually held the last weekend in August through to the beginning of September. The sale offers a range of women’s spring, summer, fall, and winter merchandise for 50-90% off original prices. Let’s just say I know where I’m going on my next girl’s trip! Club Monaco is another go-to store of mine that I’ve been shopping at since my middle school days. I love the classic style and the fit of the clothes; you can actually find really chic clothing with their sophisticated silhouettes. It’s a great place to find corporate work clothes and wedding attire if you want a sophisticated and more modest look. They have the best dresses, skirts, and tops. I’m also obsessed with their neutral tones (that they never deviate from) and how they colour coordinate their racks and shelves making it the most beautiful looking store. I’ve yet to walk into a Club Monaco that I haven’t fallen in love with. I also feel like Club Monaco is still an untapped resource. I don’t think people shop there as much because it is overpriced. But the great thing is almost EVERYTHING eventually gets marked down. You never have to pay full price if you don’t need it immediately. You just have to be patient and prowl that sale section every time you’re in. And you’ll never show up to a wedding and discover a guest is wearing the same dress as you. And let’s talk about the 80-90’s crew neck crest sweatshirt they brought back for a limited time last summer. All prayers were answered. I go through highs and lows with The Bay but it really comes down to what they can offer me and what mood I’m in. They have great price points, a wide variety of styles and brands, and target a wide age group making it convenient to shop there for everyone on your list. My favourite sections are the Lord & Taylor line, Ralph Lauren, Vera Moda, Free People, Scotch & Soda, and women’s shoes. What makes The Bay unique is all the pop-up stores and lines they carry in-store and online like: the Hudson’s Bay Collection, the Olympic Collection, Drake General Store, and Top Shop. Hudson’s Bay is also known for their BIG sales like: Bay Days, One Day Sales, and Seniors Day, etc. Bay Days usually takes place every 6 months or so (April & October) and runs for about 2 weeks. Great time to shop for items like shoes, bedding, appliances, and cookware/dining because those seem to have the best markdowns. Seniors Day offers 15% off regular, sale and clearance prices for those 60+ on the first Tuesday of each month. HBC Rewards – As an HBC Rewards member, earn points on almost every purchase in-store, online and at Home Outfitters. You can double your points when you use your Hudson’s Bay credit card with your Hudson’s Bay Rewards card or online and earn double the points. Then you can redeem your points for Hudson’s Bay gift cards to use in-store or online. Over the years J.Crew has really evolved from their classic cable knit sweaters and cardigans to leopard print flats, checked shirts, and tartan vests. I would say J.Crew has the best mix of colour and prints that bring your outfit to life and help you make a statement. They have awesome jackets, vests, blouses, turtlenecks, dresses, skirts, jeans, shorts, and t-shirts. They also carry great accessories like hair clips, headbands, sparkly necklaces, and clutches! I would definitely encourage you to sign up for their newsletter if you want exclusive offers, invites, and your first pick of new arrivals and sale items. It seems J.Crew always has a promo code to apply to your order which makes it really convenient and almost guilt-free shopping. The sale discounts range anywhere from about 20-70% off because they’re faithful at having additional markdowns off the sale price. If you’ve been following me for the last year, you know that I’m slightly obsessed with Nordstrom. My love for Nordstrom stems back to my childhood when my parent’s would take us to the states on shopping trips. We always had to stop at a Nordstrom for the full retail experience. But seriously, Nordstrom truly carries the best brands in-store and online, you literally can find something for everyone. The best part about shopping here is their customer service, the Nordstrom Rewards program, and their famous Anniversary Sale. The staff are well trained and knowledgeable which keeps me coming back. They work off commission so if you can find an efficient sales associate they will really hustle and find you great things. Every time I buy something they emphasize “if you have any issues with your purchase just bring it back”. No questions asked. You also never need a receipt because they add those sticker receipts to the tags. You shopping history is all tracked and recorded for convenience. They will also price match if you ask!!! Nordstrom Rewards – If you are reading this and you don’t have Nordstrom Rewards stop right now and go sign up in a store. If you’re a member you’ll earn 1 point for every $1 of eligible purchases at Nordstrom stores. (NOT valid for online purchases, unfortunately). You can also earn more points on bonus point days when it’s 3 or 5 times the points which is also the best. And for every 2,000 points you get a $20 Nordstrom Note to spend on anything in their stores. You can also save up your notes for a large ticket item like a handbag, shoes, or jacket. ANYTHING! Nordstrom is always great at having good sales like the Half Yearly Sale and seasonal sales, but the Anniversary Sale (aka NSale) in July is by far the best! At this sale you can shop brand new items for the upcoming season that are heavily marked down. It’s a great opportunity to shop the fall trends and grab that must-have item at a discounted rate. Read more about the sale from an older post – here. I’ve only been shopping at Scotch & Sods for the last three years but they have great jackets, dresses, and casual comfy clothes. At the Calgary location, once a season they have a private shopping event with drinks and snacks and the entire store is 20% off!!! They no longer really have a true “sale” section because of this. To get on the list you just speak to one of the sales associates next time you’re in and they’ll put you on the list. You’ll then be phoned when they have their next private shopping event. It’s kind of fun to have an exclusive shopping experience. Shopbop offers women modern style from the industry’s contemporary designer labels. It is awesome for those “it” designer pieces you’ve had your eye on whether it’s vacation wear, street clothes, formal attire, or handbags. They have their yearly “Buy More, Save More” sales in March and November. It usually goes something like this – 15% off orders $200+, 20% off 500+, and 25% off $800. The discounts apply to sale items and full-price items! Their site also offers wardrobe advice and editor’s top picks which I find myself referring to from time to time. Aritzia’s in-house label, Wilfred, is geared towards “the professional”. I tend to go there for elegant tops/blouses, sweaters, dress pants, dresses, scarves, and hats. And I can’t seem to walk out of there without dropping minimum $250 (for like two items) and running a mile long must-have list. I will say their pieces are worth it because of the quality fabrics. No polyester here…just wool-cashmere blends and silk. The chain stores are also beautifully designed to give you that boutique feel. Seasonally they do their 50-70% off select styles in-store and online. As a Royal Family fan this store is always on my radar since it’s one of Kate Middleton’s go-to stores. Every time she is seen wearing an affordable piece from there it sells out in seconds. I would shop at Zara all the time in university and for work clothes, and now I usually just hit the kids department. But, what I love about Zara is the European flare it brings to Canada. They always have reasonable prices and unique styles. When I shop there for myself I usually just focus on jackets, skirts, tops, and handbags. Let me know in the comments below where you love to shop for great women’s clothes. H&M – hit or miss but nice to buy some of the trendy pieces (that are totally a one season hit) at such a low cost. Also nice for some simple staple pieces for layering…camis, cardigans, etc. Love, love love their kid section too…again, hit or miss, but their jogggers for boys have never failed us. Girls section always a win! YES! H&M is so great for trendy pieces that you don’t want to necessarily invest in long-term. AND I LOVE the kids section too! So adorable.